Samsung has updated the Galaxy S7 and S7 Edge to Android Oreo. Both the 2016 flagship devices can now enjoy the latest Android firmware with improved performance and battery life. Samsung has introduced a lot of changes. If your phone is still running on Android Marshmallow or Android Nougat, it’s time for you to update it to Oreo. 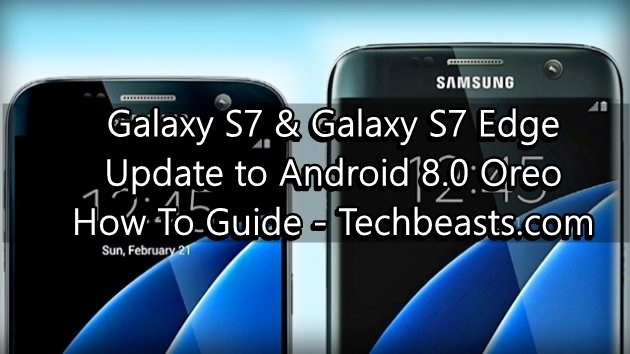 This guide will take you through the appropriate steps to update Galaxy S7 and S7 Edge to Android Oreo. For those who have no idea, the Galaxy S7 and S7 Edge were released back in 2016. These phones came out of the box running on Android Marshmallow. Samsung was kind enough to update the phones to Android Nougat in 2017. Samsung is one of the manufacturers that take too long to update their phones to the latest Android firmware. The Galaxy S7 and S7 Edge are receiving Android Oreo at the time when Google is already done rolling out Android 8.1. In fact, Google has already announced the Android P and it’s currently doing through the developer preview phase. However, as they say, it’s better late than never. Now that we have the Android Oreo out, it’s time for us to install it on the phone. Remember that your first priority should be to try the OTA method. If there is no Android Oreo OTA update available for your Galaxy S7, only then you should opt for this manual method. Follow this guide now. You need a computer (a desktop PC or a Laptop) powered by Windows to run Odin. Odin’s latest version i.e. Odin 3.13.1 is needed. Older versions of Odin do not support Oreo flashing. Samsung USB Drivers are needed for the phone. You can download them from below. Original data cable of your phone is needed to connect it to the computer. Your phone’s battery should be charged up to 50% to avoid power loss during the Oreo installation process. Backup all your important files as this is going to be a clean installation. All your previous data will be lost. Disable Windows Firewall and Antivirus if you have one. This is necessary to allow Odin to run smoothly. If you have Samsung Kies or Samsung Smart Switch, it should be closed during the firmware installation. This guide is only for the Galaxy S7 and Galaxy S7 Edge. Do not use it on any other phone. Factory reset your phone. Clean installation is always good for better battery consumption and phone performance. Follow the guide carefully now. This firmware is stock and it will not harm your phone in any way. You only need to pay attention to all the instructions. 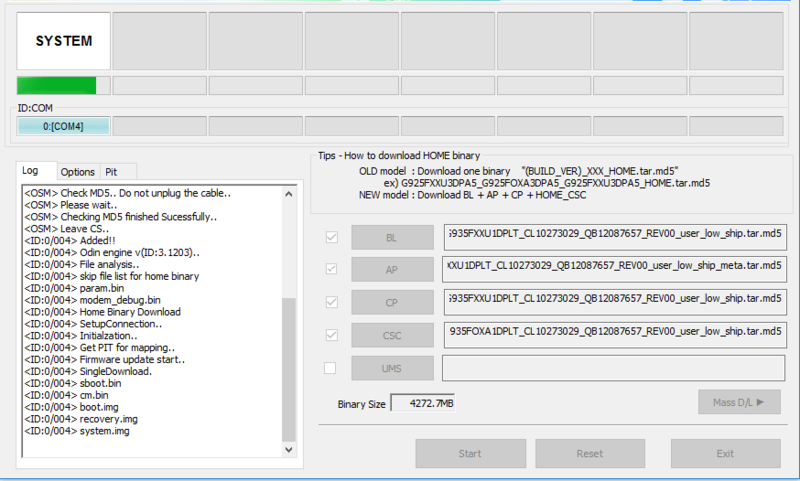 Extract the downloaded firmware file to get the AP, CP, BL and HOME_CSC files. Open Odin 3.13.1 on your computer. In Odin, click on AP tab and select AP file. Select CP file in CP tab, BL file in BL tab and HOME_CSC file in CSC tab. Now power down your phone. Press and hold Volume Down + Home + Power keys simultaneously on your phone to get into Download Mode. Connect your phone to the computer while it’s in the Download Mode. Odin’s ID:COM box will turn Blue upon successful connection. Click on the Options tab in Odin and make sure that only Auto Reboot and F.Reset Time options are selected. All other options should be unchecked. Hit the Start Button in Odin now and sit back. Wait patiently and let Odin flash the firmware. It will take about 5 to 10 minutes for complete installation. After installation, your phone will reboot automatically. The first reboot can take up to 20 minutes. Once you see the home screen, you can set up your phone and enjoy the latest Android Oreo on it. That’s all folks. We have successfully installed the Android Oreo on Galaxy S7 or the Galaxy S7 Edge. The new firmware will revamp your Settings application, the toggles in the notification panel. Some applications will show new icons on the home screen. Samsung has also added the recent files menu in the Oreo update. Overall, this new update will improve the performance of your phone. It will also result in giving you better battery life. If you happen to face any kind of issues while or after installing this firmware, feel free to reach out to me through the comments box below. You may also want to root your phone now. Here’s the guide to Root Galaxy S7 and S7 Edge running Android Oreo.